Glee, [American Horror Story, Nip/Tuck and The New Normal] creator Ryan Murphy recently told E! 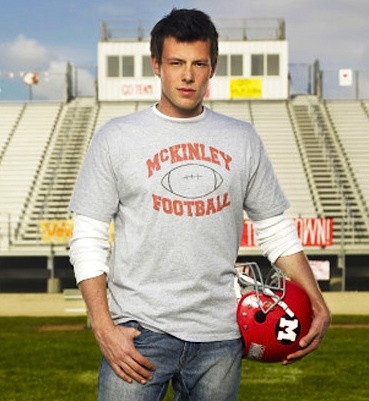 News what his last conversation with Cory Monteith, who played Finn Hudson on the popular musical show and died of a heroin overdose last week, related to. Unsurprisingly, it had to do with drugs, his job and a general unified concern for his life. Murphy was well aware of Monteith’s problem both past and present and discussed his reliance on narcotics. He also states in the interview that Cory’s on and offscreen girlfriend Lea Michele made the call on whether or not to the show would continue, and if so, when. Ultimately the person who made the decision was Lea, who felt that the best thing for the cast and crew was to be together and to get back to work and be together every day and talk about our memories of him. So we decided to do that with Lea’s blessing and we’re going to go back to work and have grief counselors on the set for two weeks because people are really hurting. It has been confirmed that Finn Hudson is being killed off the show, but his exact absence will be explained in an episode during the fifth season, which will debut a week later than originally planned, on Sept. 26. Not only is Monteith’s death extremely sad, but his co-stars and the creator who grew to know him so well had to watch him struggle and even helped stage an intervention that, in the simplest words, didn’t work. This is what addiction does to completely well-meaning people. It makes everyone feel helpless and more often than not it ends in death. If you know someone with a problem, do something. Just another thing for the fans and his co workers to have to go through. Isn’t this like realiving his death part 2? Next Next post: San Diego Comic Con Post!